Red Line. Image by Flickr user Jamil Soria. It might be a little hard to believe, but it has been three years since La Paz-El Alto’s first urban cable car system was built. On May 29, 2014, the Red Line (Spanish: Línea Roja) started providing passenger service between the plateaus of El Alto and the highlands of La Paz. Since then, three more Cable Propelled Transit (CPT) lines have opened — the Yellow Line, Green Line and Blue Line — resulting in 15km of urban gondolas. Averaged out over the years, this means that about 7.9m of ropeways have been built each day. Incredibly the work is not even half complete. Seven more cable lines are scheduled to open between now and 2019, with plans to inaugurate the White Line and Orange Line by late 2017. Once the entire urban gondola network is complete, 39 stations and nearly 34km of CPT will be operational. Metropolitan Integration Network map showing all eleven CPT lines. Image from Mi Teleferico. Leading the charge to transform urban mobility in the city is the young public company, Mi Teleférico and Austrian ropeway manufacturer, Doppelmayr. Mi Teleférico’s mandate is not only to modernize La Paz-El Alto’s chaotic transport network but to address socio-economic issues related to a rapidly growing city. For instance, cable car stations have become the focal point for community fairs and health care centres. Before the gondola lines were built, travel was often stressful, unpredictable and time-consuming as existing roadways were congested with minibuses and cars. Today, high stress levels from travelling on roadways has been reduced as the CPT lines provide commuters with a reliable, efficient and comfortable transport alternative. With each passing day, the cable car has seemingly become more and more integral to the daily lives of its citizens. Recently on May 17, 2017, the urban gondola network set another daily ridership record with 190,971 passengers. This is 11,095 more passengers or a 6.1% increase than the previous record set in June 13, 2016. Perhaps the most incredible result stemming from Mi Teleférico is related to its financial viability. 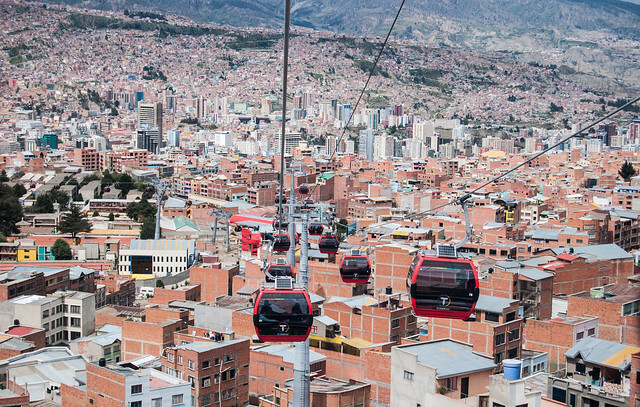 Unlike most public transit systems, the urban cable car network in La Paz requires zero subsidies. In fact, a surplus of US$2.5 million (Bs 17.5 million) was actually generated in 2016. This effectively places Mi Teleférico amongst an incredibly rare and elite class of transit systems with a farebox recovery ratio of more than 100%. Based on online data, La Paz would be 1 out of 8 transit agencies that meets this threshold and would be the only mass transit system in South America in this exclusive class. As the only major city in the world to build its entire rapid transit backbone on CPT technology, La Paz’s cable cars continues to be trailblazers in the urban transport industry. Given its successes so far, the future looks bright for the world’s highest city.